It is usual with blogs to include pictures, but only if one takes a camera! So apologies for the omission. 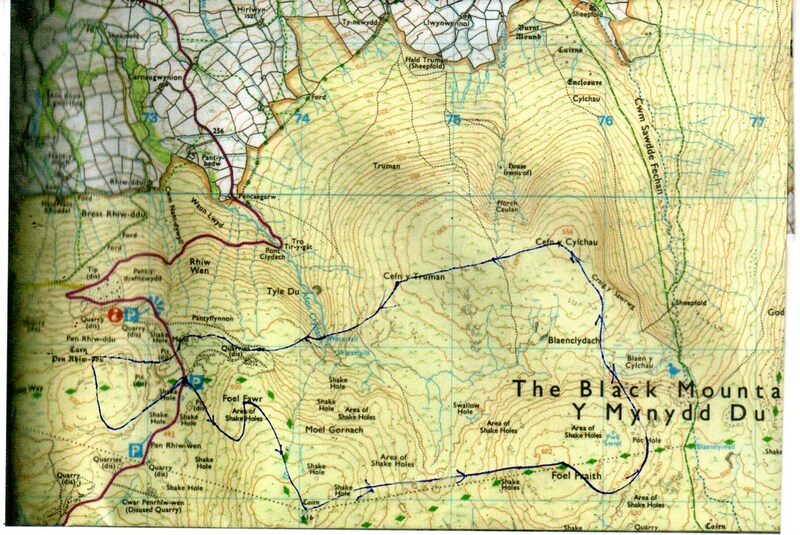 Today’s walk was in the company of Chris and the destination was the Black Mountain starting from the quarries just off the Llangadog to Brynamman Road (middle car park). Although the forecast was hopeful in that rain was not due to fall, the wind strength was very high. In fact my wife had said she had come close to been blown over in our village! Still we could always find somewhere else if too bad. Below is the map of the area walked. Pushing the car door open was not easy and a foretaste of what was to come. We kitted up apart for gloves for Chris, but he looked very fetching in his top to toe OMM gear including the rucksack. Our first target was Foel Fawr and then south eastish to the unnamed cairn (616 metres) where we had a quick coffee break. If this had been frothy coffee the froth would have been short lived! Suitably refreshed we pushed on into the strong wind and headed for Foel Fraith. There were clear views over to the crags on the other side of Cwm Sawdde Fechan and on to the Carmarthen Fans. Looks a good backpacking trip, but not today. We now turned north westish and leant into the wind heading for Cefn y Cylchau passing many shake holes. Despite some recent heavy downpours the going was reasonably dry. Next up was the small cairn on Cefn y Truman where we had a first lunch stop, hiding behind a mini windbreak. From here we walked down towards the Afon Clydach hoping this was not a raging torrent. Just before the river was a jumble of rocks which we used to have a wind free second lunch. The river was fine and I found a place to just about make a jump across and Chris rock hopped a little further downstream. From the other bank we walked close to the river to view the steep waterfalls and down into the valley. This looks like an interesting way up – next time. We now turned uphill for the obvious quarry roads on the north side of Foel Fawr. Lots of industrial history here and we ventured into one of the huge lime kilns where there were some old wooden tools now encased in calcium(?). Although we were not far from the car we decided to cross the road and visited Carn Pen Rhiw Ddu and then wandered back. A good but a very windy day.